Eight mini-satellites packed snug inside a Pegasus rocket slung under a modified jumbo jet will fire into orbit Monday off Florida’s East Coast, launching on a $157 million NASA mission that could help forecasters better predict how strong hurricanes will be when they strike land. The self-contained spacecraft are part of NASA’s Cyclone Global Navigation Satellite System, or CYGNSS, a project conceived to peer through rain shafts into the cores of hurricanes and measure their winds. Other satellites, like those equipped with microwave radars, are not sensitive enough to see through rain, and they do not pass over hurricanes often enough to yield information that might be valuable for real-time forecasting. “Things happening in the center of a hurricane, right now, are just about impossible to measure from satellites for two reasons,” said Chris Ruf, the CYGNSS mission’s principal investigator from the department of climate and space sciences and engineering at the University of Michigan. “One is there is a lot of rain in hurricanes, and you can’t see thorugh heavy rain with satellite remote sensing techniques. That’s one. Coverage from observing satellites in polar orbit is not as thorough in the tropics. In selecting such an orbit, engineers and scientists gain global coverage, but the satellite can only see winds at low latitudes once every three days, and even then can be blinded by rain. Built by the Southwest Research Institute in San Antonio, each one of the CYGNSS observatories weighs just 64 pounds (29 kilograms), not much more than the weight limit for carry-on luggage. 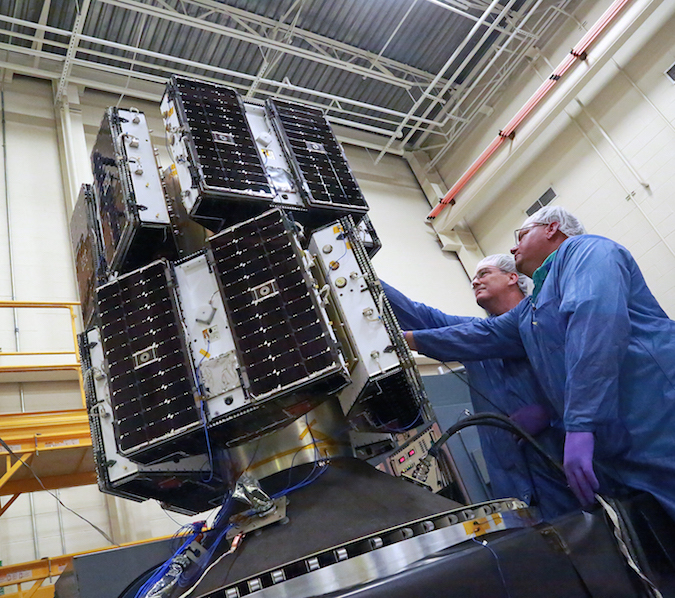 Mounted together on an adapter module supplied by Sierra Nevada Corp., the satellites are folded up to fit inside the envelope of their air-launched Orbital ATK Pegasus XL rocket. Once in space, they will unfurl solar panels extending around 5.5 feet (1.7 meters) across, shorter than the wing span of an average adult bald eagle. The Pegasus XL rocket was attached to the bottom of Orbital ATK’s carrier plane Nov. 28 at Vandenberg Air Force Base in California. Orbital ATK’s launch crew assembled the three-stage Pegasus XL at Vandenberg Air Force Base in California, added the CYGNSS payloads, and connected the rocket to the L-1011 aircraft before ferrying the launcher on a transcontinental trip to Cape Canaveral on Dec. 2. 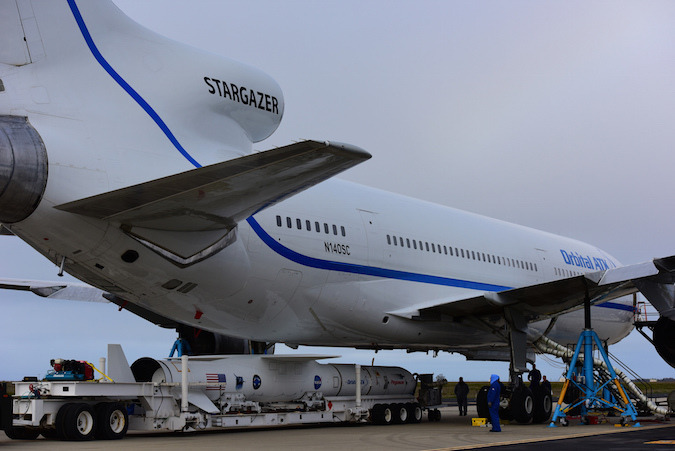 Since arriving at Cape Canaveral Air Force Station’s Skid Strip, the Pegasus team has completed a combined systems test to ensure the rocket, satellite and carrier plane are all functioning as expected. The launch team conducted a launch day dress rehearsal Friday. A launch readiness review Saturday cleared the mission for flight, pending the resolution of a minor concern with the closeout of wire ties on the winged rocket, according to Tim Dunn, NASA’s launch director for the CYGNSS mission. The L-1011 mothership, the last of the 1970s-era Lockheed-built jumbo jets still operational, will take off from Cape Canaveral shortly after 7 a.m. EST (1200 GMT) Monday, and head for a drop box over the Atlantic Ocean around 100 miles (160 kilometers) east of Daytona Beach. Once aligned on an east-southeast heading at an altitude of 39,000 feet (11,900 meters), the crew aboard the L-1011 will activate the Pegasus rocket’s steering fins, and the pilot will issue the command to drop the 51,000-pound (23-metric ton) launcher. The drop should occur around 8:24 a.m. EST (1324 GMT) if all goes according to plan. That’s five minutes into Monday’s hour-long window, which extends until 9:19 a.m. EST (1419 GMT). The expendable rocket will switch on its destruct system once clear of the aircraft, then light its solid-fueled first stage motor with 160,000 pounds of thrust around five seconds after the drop command. A top-mounted wing will provide lift to pitch the rocket’s nose up, and rear-mounted fins will steer the Pegasus XL in the first minute of the flight. Two more rocket motors will fire to put the CYGNSS satellites into orbit in less than eight minutes. The Pegasus flight computer will target an altitude of 317 miles (510 kilometers) for deployment of the satellites two-at-a-time beginning 13 minutes after launch. Orbital ATK’s Pegasus rocket has flown 42 times before, logging 28 straight successful missions going into Monday’s launch. The CYGNSS mission marks the first Pegasus mission staged from Cape Canaveral since 2003, an interlude in which the air-dropped rocket continued launch services from Vandenberg and Kwajalein Atoll in the Marshall Islands. The separation sequence should be finished by the mission’s 14-and-a-half minute point. The CYGNSS satellites will automatically unfurl their solar panels, then make first contact with ground controllers around three hours after launch, a crucial milestone when engineers will confirm the health of the spacecraft. Early next year, the CYGNSS ground team will start maneuvering the satellites to their proper positions in a “string of pearls” orbit grouping. The diminutive satellites do not have their own rocket engines, so engineers devised a way to use torque wheels to pivot the observatories up or down and use the force of aerodynamic drag to fine tune their orbits. For example, tipping the satellite’s orientation to expose the blunt side of its solar panels to the air flow — light but still measurable at the CYGNSS fleet’s altitude — will cause the craft to slow down and change position relative to the rest of the constellation. Once the spacing is settled, each satellite will be about 3,000 miles (5,000 kilometers) apart with their tracks taking them between 35 degrees north and south latitude on each hour-and-a-half lap around Earth. 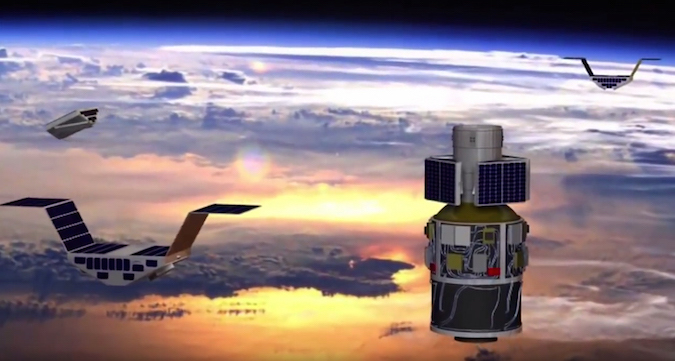 Science data will be passively collected by the CYGNSS satellites as a byproduct of the continuous navigation signals broadcast by the U.S. military’s Global Positioning System network. Receivers aboard each spacecraft will listen for long-wave signals from GPS satellites bounced off the ocean’s surface. The intensity of the reflected radio waves will tell scientists about the ocean’s roughness, from which computer algorithms can derive an estimate of the winds causing the choppy seas. CYGNSS is not intended to feed real-time data to hurricane forecasters, officials said. 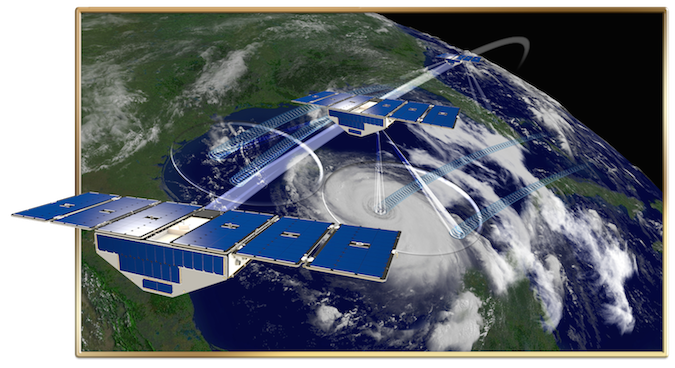 It is geared more for research and development, with objectives including the demonstration that reflected GPS signals are useful for tropical weather forecasting, and the collection of new insights into the inner workings of hurricanes. The GPS reflections have been detected before, but have not been exploited for research. The lessons could be applied to a future satellite mission to route data on active hurricanes to forecasters, or to improve that numerical computer models that generate tropical weather predictions. Ruf said scientists are specifically interested in using data from CYGNSS to better predict intensity fluctuations in tropical cyclones. Such changes in strength are notoriously difficult to predict, and they could mean the difference between life and death for residents on the coast. “For the most part, there’s been little improvement in our ability to forecast how strong a hurricane is going to be, but a lot of improvement in forecasting where it’s going to go,” Ruf said. The only sure way to detect winds in the heart of a hurricane now is with NOAA and U.S. Air Force hurricane hunter aircraft, which fly through a storm’s eyewall to directly sample the conditions at the most intense part of the cyclone. Each CYGNSS observatory carries a doppler radar instrument — made by Surrey Satellite Technology, a Colorado-based subsidiary of Britain’s Surrey Satellite Technology Ltd. — consisting of two Earth-facing antennas to gather GPS radio waves scattered off the ocean, and an antenna mounted on the opposite side of the spacecraft to collect undisturbed signals directly from the GPS satellites flying more than 12,500 miles (20,000 kilometers) above Earth. Ruf compares the distortion effect to the difference between the full moon’s reflection in a lake without wind, and the twinkling moonlight reflected in a breeze. “CYGNSS is basically the receive half of a radar, and the transmit half of the radar is the GPS constellation of navigation satellites” Ruf said. The passive nature of the CYGNSS satellites allowed designers at Southwest Research Institute, a senior partner on the mission with the University of Michigan, to simplify the spacecraft to fit the size and mass constraints of a light-class Pegasus rocket, and the tight budget imposed by NASA. The space agency said the CYGNSS mission, selected in a competition in 2012, came in on schedule and on budget. The concept of CYGNSS is “like having a broadcast radio station up in the air (with GPS), and all you have to have on-board the CYGNSS spacecraft is a small little receiver,” said John Scherrer, CYGNSS project manager at SWRI. The CYGNSS satellites were the first spacecraft of their size to be built up at SWRI’s San Antonio campus, which has produced space instruments for decades, including sensors aboard NASA’s New Horizons mission to Pluto and the Juno mission orbiting Jupiter. The CYGNSS mission is approved for at least two years, but the satellites are designed to function at least five years, Scherrer said. Each spacecraft is capable of recording and processing four reflected GPS signals simultaneously, then downlink the results to scientists via ground stations in Hawaii, Chile and Australia. Hurricane experts from the National Hurricane Center plan to examine the data to determine its utility in operational forecasting. Ruf said the mission should be ready for action in time for the start of the North Atlantic hurricane season in the spring. “With eight satellites, and with each satellite being able to make four measurements of the wind, it’s kind of like having 32 virtual P-3 airplanes some place in the tropics measuring winds at all times,” Ruf said.